I had in my original release of kQOAuth some pieces of code in the HMAC-SHA1 implementation that used C char pointers as data arrays instead of QByteArrays (you can blame my laziness for this...). These caused issues on non-UNIX based Qt platforms like Symbian but also on Windows, of course. I have now replaced those parts with pure Qt implementations. So now kQOAuth should run on all Qt platforms without issues! I would love to hear how this works on Symbian, since I don't own a Symbian device and can't test this myself. I could imagine the library having some use on Symbian based devices. That said, I haven't included any Symbian specific installations or compilations options since I am not familiar with Symbian either. Contributions regarding this would be more than welcomed. For more information about kQOAuth, please visit http://www.johanpaul.com/blog/kqoauth/. I use TweetDeck on my PC as my Twitter client and before that Gravity on my Nokia 5800 S60 phone. But I haven't yet found a proper Twitter client for my N900. Mauku has been there since the beginning and Witter is one of the newest additions to Twitter application on the N900, but both of them seem to be still work in progress and lack some important features. I am a fairly active Twitter user (Tweetdeck is occupying my secondary monitor on my PC :)) so naturally I have been waiting for a proper Twitter client for my N900 too. But I need to define what proper means. I want my N900 Twitter client to have a very good timeline view. Something that Gravity and TweetDeck have, with clear colors and avatar images. I also want to have separate views of my (hashtag-)searches and tweets that mentioned me. And of course it has to be simple to switch between these views. I also want to have some basic functionality in my mobile Twitter client such as opening URLs from Tweets, re-tweets and @-replies - direct messages are then probably not difficult to add, but I don't use them. The overall look 'n feel has to be nice. This means the kinetic scrolling must be fluent for the timeline view. Adding friends and searching for friends are maybe secondary features as my Twitter usage on the N900 would anyway me more fast paced and wanting to have an overview of what is going on. This would be proper Twitter client in my opinion. If I ever start working on such a project, I would do it with Qt in C++. But I would probably not use QWidgets and the native user interface on the N900, but do it in GraphicsView instead for more control of the widgets and items. This would also allow me to use the Animation Framework with the Qt State Machine. I can already imagine how to utilize those for the items in the list and new tweets 🙂 What would your proper Twitter client be for the N900? The Nokia N900 is probably the hottest new mobile device out there right now. 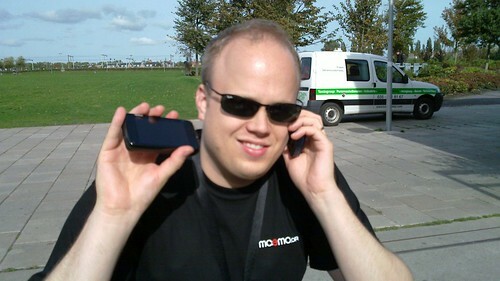 I received my N900 a little over a week ago at the Maemo Summit 2009 in Amsterdam. As you probably already know, Nokia was kind enough to give an N900 for a 6 months loan to every summit attendee so we got our N900s well before anyone else. You can only imagine the amazement in the crowd when Vice President of Maemo Devices in Nokia Mr. Ari Jaaksi announced the news in his key note. Nokia just got 300 very happy community member friends!